How do I fit into the world of business? 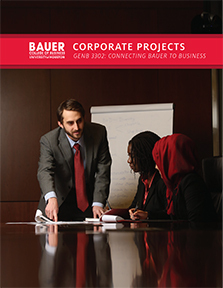 Unique Opportunity: Students will learn from top corporate recruiters of the Bauer College of Business who will present “the real world of business.” To supplement the in-class discussions, students will complete individual and team readings, projects and presentations outside of class to further explore and understand these issues. Students will also practice business communication skills to help them be more successful in the corporate world. Unique Teaching Method: The course is taught as a hybrid course online and once a week in-class sessions, plus “labs” that include speaker series, career panels, and workshops by industry leaders. The course incorporates an online business game that recently was awarded an International Summit Creative Award Silver Medal. NOTE: GENB 3302 is a required course for the BBA degree at the Bauer College of Business, University of Houston for new pre-business students starting Fall 2007. It is open to all students who have completed the prerequisite of freshman English.